You're strolling up a hill in San Francisco's Marina district, just a few blocks shy of the lapping waters of the dock. Steamy, delicious hot dog in one hand. Cold iced-tea in the other. Friends on either side, chatting. Then, hmmm. Lookie here. Spray painted against a building. What do you think of this? The words inscribed in her skirt - "get up get up get up get up" - a call to arms? That gas mask - so creepy! 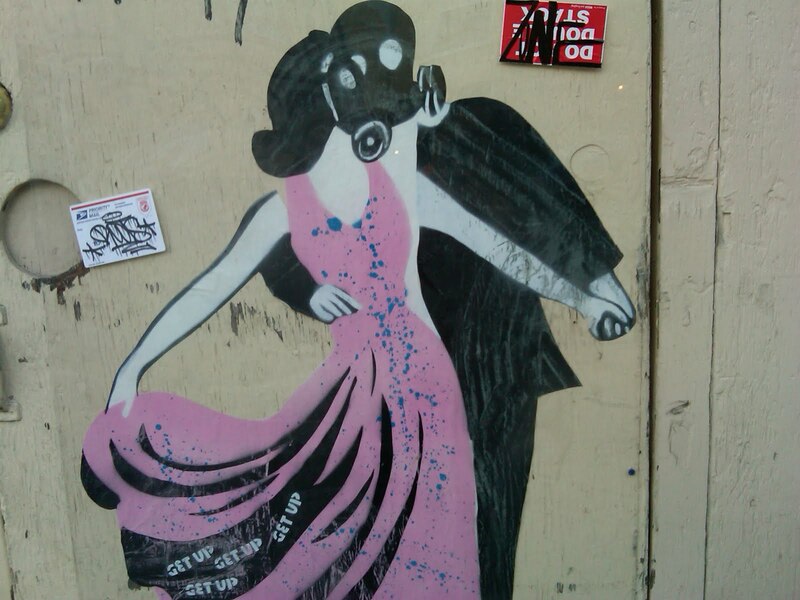 Some debate the origin of the gas mask in street art but most agree Banksy popularized it (some might hypothesize this is his piece) and even more agree it's iconography ties to British air raids as a symbol of political oppression, groupthink, and a calm acceptance of unacceptable terms. A regular day, no admission fee, and 20 minutes of philosophical discussion with food in hand. My favorite museum is the street when you weren't expecting it. My favorite piece is whatever happens to be around to catch my attention. Get up get up get up get up. There's a museum all around you. huh, i would love to see that. i'm not a photographer, but i do love photographs, especially of cities and people, and sometimes i'll be wandering around a city and see a tableau that i think would make a beautiful photo. (often they are bleak and dirty scenes that have a peculiar beauty to me.) this is a sort of outdoor gallery, i suppose. LOVE this! Yes, street art is about my favorite kind. 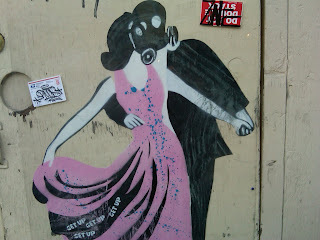 From formal murals to "graffiti", I love it when art interacts with the world around us. Oh my! You've got me up and out of my lazy west side cozy-nest now!!! THANKS!